� Save Money - Did you know there are lots of FREE software options available for use over the internet (cloud computing) that will save you hundreds annually per PC. 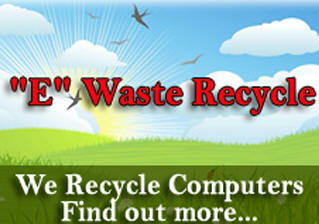 View our post on Free Software. � Conserve Energy - Shut your computer off or put it in sleep mode when you're at work, away from your computer or sleeping. When you set your operating system to automatically fall into sleep mode and eventually hibernate is an easy way to conserve energy. � Surge Protectors - surge protectors they are using and advise them on adjustments they can make, like turning off the entire surge protector to ensure peripherals don�t draw power when they aren�t in use. � Upgrade Instead of Buying New. Did you know purchasing a new PC is not always necessary? Upgrading crucial computer components will give your PC the equivalent power and speed of a new computer. By waiting to purchase a New PC until it�s absolutely necessary you extend the life of the equipment you own & often you get a better deal. � E-Waste Recycle - last but not least we help our customers take a responsible approach on disposal of old computer parts. We accept old computer parts for donation to non-profit organization StRUT. Call us today 480-262-9598.